A rare chance to sample Tasmania's impressive Chardonnay, Pinot Noir and Cabernet Sauvignon - with an expert to guide you. 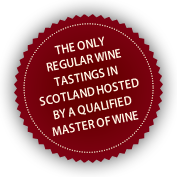 Enjoy a four course seated dinner with eight fine classic wines in one of Edinburgh's top restaurants. A chance to dine in one of Scotland's top restaurants.